You’ve probably seen quite a few beautiful home designs labeled ‘rustic’. Finding a common theme between the different rustic styles can get a bit tricky, however. People use this term on everything from log-cabin, to coastal, to Tuscan-style design. So what, exactly, is rustic design? Rustic design is a catch-all term used to describe a style of decorating that is that’s natural, rough, aged, and/or casual. It’s usually a cozy style with handmade, over-size furniture and natural textiles. Rustic is sometimes considered the opposite of ‘modern’. However, you might find that you like contemporary rustic design, which fuses elements of modern style with rustic elements. A large percentage of furniture used in rustic designs is handmade, typically from natural materials. We’re talking solid-wood tables, over-sized chairs with comfy cushions, and hand-woven blankets. Typically, rustic furniture has a cozy, livable look and feel. Rustic designs often use wood flooring, barn doors, and exposed beams as well. Neutrals abound in rustic design. Materials are often left their original color, so you get lots of natural wood and stone tones. That doesn’t mean no bold colors, though. As long as you stick with natural earth-tones you’re good. Greens, browns, and grays are common, but earthy reds and blues that look like sky and water fit the style as well. There’s usually a certain amount of roughness to rustic design. Raw woods and stone typically form the backbone of the design, offering a variety of natural textures and colors. Reclaimed wood is often used since it has an aged look to it that’s perfect for rustic design. In textiles, you’ll almost never see something with a sheen. Raw fabrics fit the aesthetic much better. For a more contemporary rustic look, you can bring in some modern elements like the metal that we use in our modern and industrial furniture collections. All the elements of rustic design should come together to create a comfortable, inviting atmosphere. That’s one of the main goals of incorporating rustic elements into your interior design. Even with some raw materials and rough edges, it all comes together to make a space that feels homey. Do you want to incorporate rustic design into your home? If so, handmade solid-wood furniture and barn doors are a great place to start. You can shop online to see what kind of rustic designs we make or contact us if you have a custom request. Wood furniture is remarkably sturdy and long-lasting. With proper care, many pieces can become treasured heirlooms. When you’re using your wood furniture every day though, scratches, dings, and other marks are almost inevitable. This is especially likely when you’re entertaining, such as during the holiday season. You can protect your wood by using tablecloths, placemats, table runners, potholders, and coasters. If marks do show up on your table, try these tips to remove the marks or at least make them less noticeable. Petroleum jelly – apply jelly to the mark and let it sit overnight. Wipe off in the morning. Non-gel toothpaste – rub toothpaste onto the mark with a soft cloth, following the wood grain. Wipe off with a damp cloth, then let dry. Baking Soda – mix 2 tablespoons soda with 1 teaspoon water to make a paste. Rub over the water mark using a circular motion. Light colored stains come off the easiest. Darker stains might require several treatments. The petroleum jelly is gentlest, so start with that. If the stain doesn’t come out, try toothpaste next and then baking soda. After you get the stain out, polish your table with a wax polish. We recommend using Howard Feed-N-Wax Wood Polish and Conditioner. Shallow scratches, nicks, and dings are usually surface issues. They affect the finish rather than getting deep enough to damage the wood. If you look at the scratch on an angle and don’t see discoloration, then the scratch is only on the surface. Here at Rustic + Modern, we finish all of our furniture with satin polyurethane. This finish offers durable protection against everyday use. If scratches develop in this type of finish, start by buffing a paste wax furniture polish into the scratch. This is often enough to hide scratches. If the wax doesn’t hide your scratch and you want to try refinishing that spot, sand over the scratch with fine steel wool. Sand with the grain using light pressure until the scratch is no longer visible. Wipe the sanded surface with a clean, damp cloth and let it dry completely. Apply a thin coat of satin polyurethane to the scratch and let dry for 24 hours. Repeat polyurethane coats until the finish over the scratch is level with the rest of the table. Rub the nut meat or a walnut, almond, pecan, or Brazil nut into the scratch. This works best for light to medium colored woods. Dab coffee grounds or a damp tea bag over the scratch. Wipe excess away with a paper towel, then repeat until colors match. This works best for medium to dark colored woods. 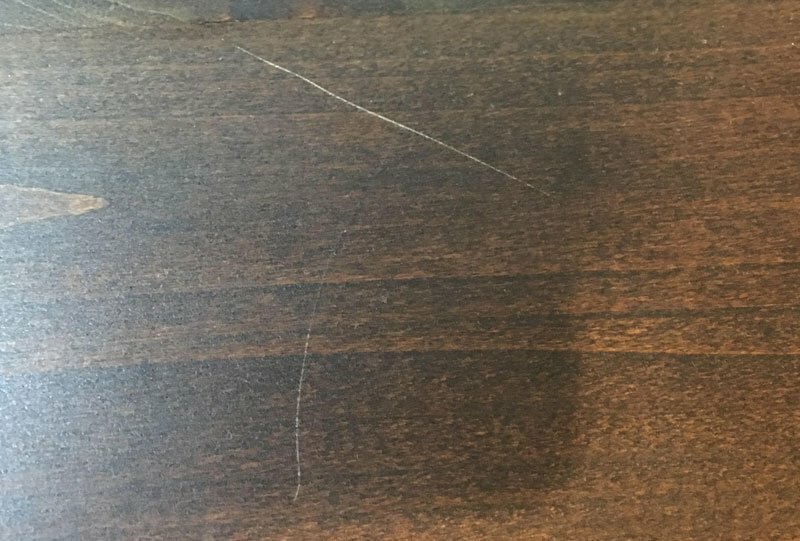 Use a felt-tip marker the same shade as the wood to hide the scratch. Polish with a wax-based furniture polish. You can also try touching-up the finish over deep scratches as described for light scratches. Remember also that wood furniture can be completely refinished if the surface becomes too marred, unlike furniture made with veneers or engineered woods. That’s part of the beauty of investing in solid wood – even many years of wear-and-tear isn’t going to make it unusable. If you’d like to order a new, solid wood table, get in touch with us at Rustic + Modern. All our tables are hand-crafted from high-quality solid wood. You’ll get a table made to your exact specifications – the kind of furniture you’ll want to keep around for many years. Holidays are just around the corner. If you’re inviting guests over, there’s a good chance the party’s going to revolve around your dining room table. You can make a great impression (and get yourself a holiday treat to enjoy year-round) with a new solid wood farmhouse table. 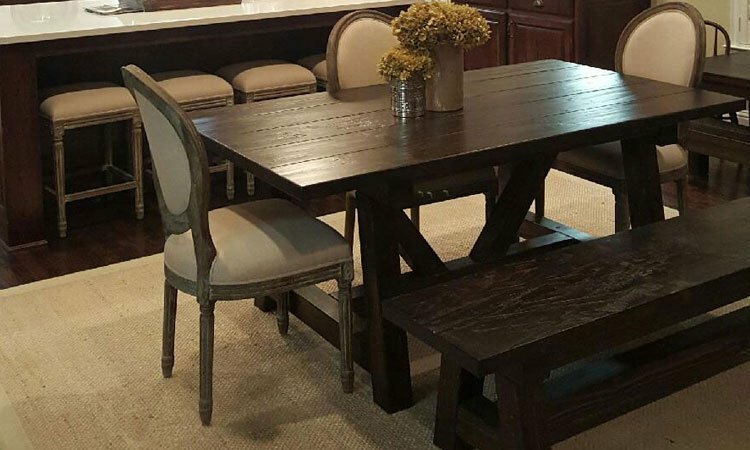 These are the style of tables people think of when they think farmhouse dining room design. But they’re not limited to rooms decorated in a farmhouse motif. Use farmhouse-style tables in all types of rustic design, retro room décor, and even modern dining rooms. Sturdy, solid, simple. Our Classic Farmhouse Tables are a staple of rustic design. These tables feature a solid wood tabletop with straight, squared legs at each corner. They’d look fantastic in any casual dining room. For the most rustic option, choose hand scraped distressing for the tabletop. We can also make matching benches in your choice of wood. Dress-up the classic farmhouse design with Turned Leg Farmhouse Tables. Whether you want to use the table in a room that’s slightly more formal or just want to add interest to your furniture, this table is a great choice. The legs can be rounded or squared depending on your preference. Stain the table for a classic appearance or have it painted and/or distressed if you prefer the shabby-chic look. Another variation on the classic design, our V-Base Trestle Tables feature A-frame leg supports and a V-shaped center brace. 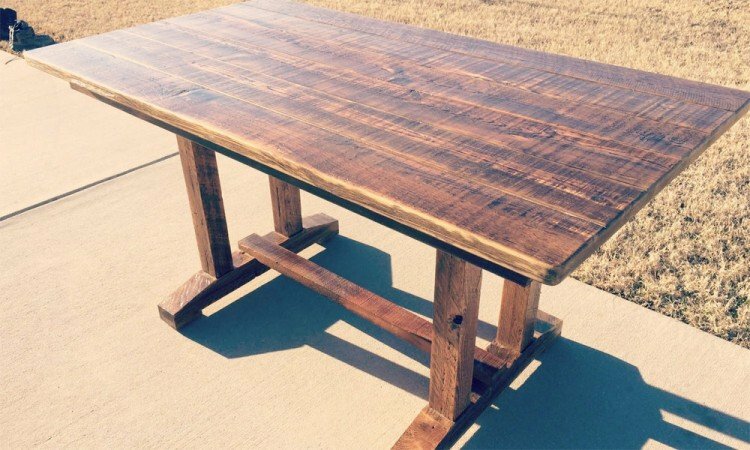 These tables will look great in any dining room with a rustic decorating scheme. The creative construction also makes it a good choice for modern designs that feature wood as a decorating element. Our newest addition to the Rustic Collection, Pedestal Farmhouse Tables let you seat more people without bumping against the table legs. In this design, the legs are tucked under the tables and held in place with a sturdy beam-constructed base. It’s perfect if you plan to entertain or if your family is growing. Veering away from the rustic look, our Industrial Farmhouse Tables mix modern metal with classic farmhouse table design. 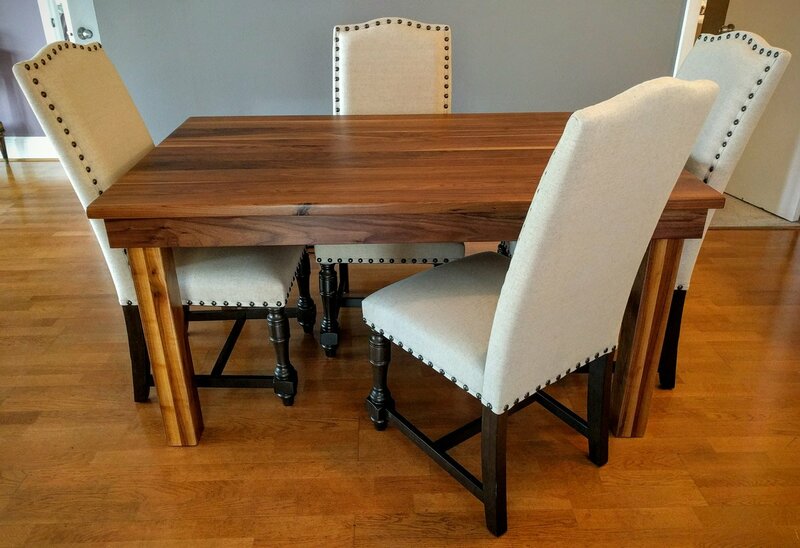 These tables look similar to the Classic Farmhouse Table, but with metal pipes connecting the table top and the legs. It’s a bold furniture design that’s sure to draw compliments. With all our tables, you choose from a wide variety of woods, stains, and smooth or distressed finish treatment. These customizations make the furniture extremely versatile. Match your table to existing wood in the room or make it a focal point with the exact characteristics you like. Whatever style you choose, we’ll make sure it’s quality craftsmanship that can last for years to come. Who knows? Sitting around your new farmhouse table might become a favorite holiday tradition.